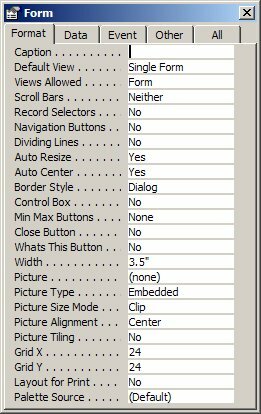 This month, Doug Steele looks at how you can enhance the built-in InputBox, as well as how to programmatically call a couple of the standard Windows dialogs (the Color and Font dialogs). Is there any way that I can use the InputBox, but conceal what’s being keyed in, like what happens when you’re keying in a password? Unfortunately, VBA’s built-in InputBox doesn’t provide much flexibility. You can change its title, its prompt, its default value, and where it appears on the screen–but that’s about it. Even some of the flexibility that the InputBox says it supports, it doesn’t actually support: While the Help file talks about the capability of providing arguments that specify a Help file and Help context for the InputBox, Access actually ignores those values, and no Help button appears on the InputBox. It’s still possible to accomplish what you’re trying to do, but you’ll have to roll your own form. Creating the form is pretty simple, so I won’t help you with that. All that’s needed is a simple form with two command buttons (OK and Cancel), a label, and a textbox (see Figure 1). Set the form’s Format properties as shown in Figure 2. When you open the form, you’ll see that it looks pretty much the same as the built-in InputBox. Of course, you’re not done. First of all, typing anything into the textbox isn’t concealed, which is what you want, and there’s no easy way to get the value that you type into the textbox. Handling the first omission (what’s typed in the textbox not being concealed) is pretty simple: Set the textbox control’s InputMask property to “Password”. Getting the value back from the form involves a little more work. Now, I’m not going to say that my approach is the best, but the method that I use works successfully for me. For instance, I could simply create a form with preset properties, but I want to be a little more flexible: I’m going to make many of the properties on the InputBox replacement form be programmable. I find using a class module lets me control managing those properties a little better. One warning: The following code doesn’t show all of the properties of the form that can be changed. 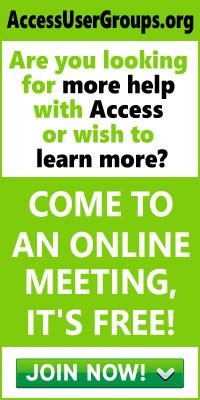 Check the accompanying database in the download to see more. Also, since Access didn’t implement the Help button on the InputBox, I’m going to ignore it too, although you’re welcome to add it yourself! So what properties of the InputBox do I control? Obviously, my InputBox replacement needs to have at least the same capabilities as the built-in InputBox, so I have to be able to set the title, prompt, default value, and x and y positions for the form. Since the whole point of this InputBox replacement was to allow control over the InputMask (to allow you to hide what’s being keyed there), I want to be able to set that property as well. I decided that I also wanted to control the font used for the prompt as well as the text being entered and, furthermore, I wanted to allow those formats to be set independently. I allowed for the form color to be changed programmatically, too. Finally, I provided the ability to change the button captions from “OK” and “Cancel” to any other text that you might want. 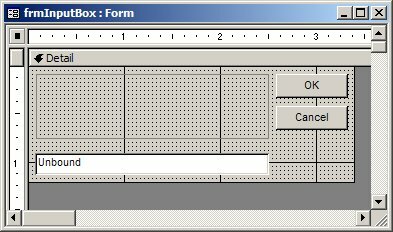 The basis for getting the value passed back from the InputBox replacement form to the calling function is to open the form in Dialog mode. Opening a form in Dialog mode means that no further processing will take place in the program until the form is closed. By having the form write to a public variable (or, in this case, set a property in the class), I can determine what was typed into the box. mstrTitle = "Doug Steele's InputBox Replacement"
As you can see, the InputBox routine opens the form in Dialog mode. Because I’ve opened in the form in Dialog mode, all processing stops on the OpenForm line until the user clicks on the form’s OK or Cancel button. .Title = "Testing my input box"
.Prompt = "Type in a value:"
And, yes, I’ll admit that this solution is a little messy because it has that global variable gclsInputBox that’s defined in mdlInputBox. But it does work and not only meets your goal for a password-like input box, but also provides you with even more flexibility. Your solution involves setting Color and Font properties. How can I know what values are valid? The values Access uses for Colors and Font information are standard Windows values. However, there’s a simpler way than having to type in new variable names or remember cryptic numbers: You can invoke the standard “picker” dialogs that are included in the comdlg32.dll that comes with Windows (shown in Figure 3 and Figure 4). I’ve set this function up to return the RGB value of the selected color. In the event of an error occurring, the function returns the RGB value for White (an arbitrary choice on my part). The more curious among you may want to know what Flag values are possible. I’ve listed the values in Table 1. Table 1. Valid values for Flag in the CHOOSECOLOR structure. CC_ANYCOLOR Causes the dialog box to display all available colors in the set of basic colors. CC_ENABLEHOOK Enables the hook procedure specified in the lpfnHook member of this structure. This flag is used only to initialize the dialog box. CC_ENABLETEMPLATE Indicates that the hInstance and lpTemplateName members specify a dialog box template to use in place of the default template. This flag is used only to initialize the dialog box. CC_ENABLETEMPLATEHANDLE Indicates that the hInstance member identifies a data block that contains a preloaded dialog box template. The system ignores the lpTemplateName member if this flag is specified. This flag is used only to initialize the dialog box. CC_FULLOPEN Causes the dialog box to display the additional controls that allow the user to create custom colors. If this flag isn’t set, the user must click the Define Custom Color button to display the custom color controls. 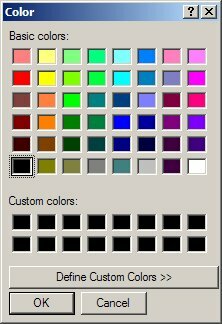 CC_PREVENTFULLOPEN Disables the Define Custom Color button. CC_RGBINIT Causes the dialog box to use the color specified in the rgbResult member as the initial color selection. CC_SHOWHELP Causes the dialog box to display the Help button. The hwndOwner member must specify the window to receive the HELPMSGSTRING registered messages that the dialog box sends when the user clicks the Help button. CC_SOLIDCOLOR Causes the dialog box to display only solid colors in the set of basic colors. By the way, while we’re on the topic of colors, you may not be aware that there are predefined values that can be specified so that the user’s preferences are used. Instead of setting a property to some specific color, these values tell the property to pick up the value used in some Windows setting. I’ve listed those values in Table 2. Table 2. System color values. As an example, if you want the background of your form to be whatever color the user has specified for the Windows background color, you can set the BackColor property to vbWindowBackground (or -2147483643), the value for screen element Window in Table 2. You have some flexibility in how you use these constants. The Windows system color value refers only to the color of the screen element listed, not to the type of object it can be assigned to. For example, you could set the BackColor property for a textbox to the Windows system color for scroll bars, the desktop, or any other screen element. The key point about using these values is that these values stay constant, regardless of the user’s color settings. As I mentioned earlier, the ChooseFont API call isn’t nearly as straightforward as ChooseColor, partly because the ChooseFont call doesn’t just return a single value. 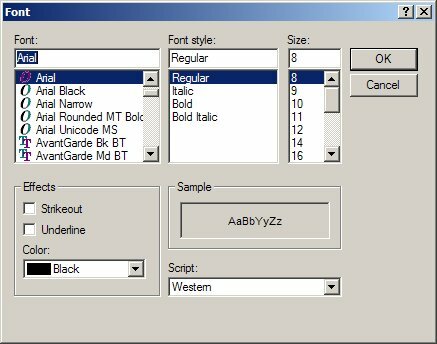 I’m not going to reproduce the code necessary to use the ChooseFont call here; you can see it in mdlFontPicker in the download database. The function FontSelector expects a structure to be passed to it. If the structure is populated with values, those will be the values used to initialize the Choose Font dialog. After FontSelector finishes running, whatever values were selected in the dialog by the user are passed back through the same structure.